Having worked therapeutically and theatrically with the Mystery Plays in recent years, I have discovered in them robust containers for individual and community exploration, reflection and celebration. In directing the Lincoln Cycle for the first time my intention has been to facilitate a diverse company, involving new members of the community extending in ways beyond the formally dramatic, to experience the plays and to share them afresh with each new audience, in seriousness and playfulness. Diverse perspectives and interpretations are possible of what I hope is also a straightforward, entertaining show. In what you see tonight our Everyman Jesus has come down to a single player, though photographs show four others exploring the role in Stations of the Cross, and other performance parts are unexpectedly doubled; an Unholy Trinity try to match the Holy one, for example, showing on-going conflicts played out on a psychological, social and spiritual scale. The sense of challenge and choice on the journeys we all have to make are reflected in microcosm in our travels together through the performance. Approach them with an open heart if you can, in that same spirit with which we wish to share them with you. 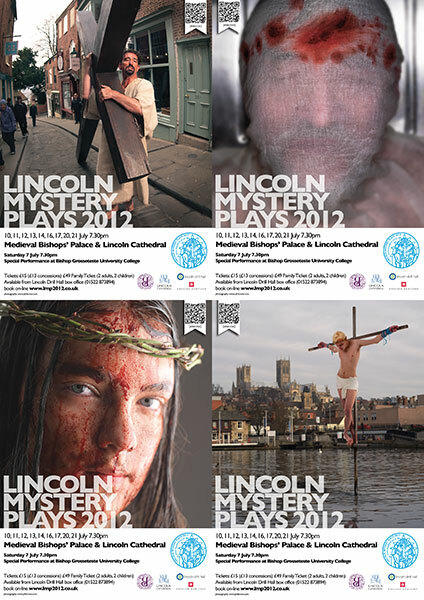 Thanks to my employers and family for giving me the time to take the project on, to the artists who have collaborated in the process, the production team enabling it to happen, the performers and audience members bringing it to life and all those individuals and institutions in the city and beyond supporting the renewed tradition of Lincoln Mystery Plays. See you again at Doomsday if not before! Chris Adams, Ruth Andrews, Michael Church, Andrew Cox, Sasha Drennan, Karen Duncombe, Ken Frape, Stephen Gillard, Katie Greathead, Rebecca Greene, Carolyn Jones, Alice Kinloch, Sarra Krupinski, Tom Manson, Chris Matthews, Kate Mclennan, Irene North, Sonia Rossington, Ash Scott, Bob Shirley, Harry Smart, Rachel Taylor, Shelia Thomas, Alex Thornton, Su Toogood. The idea behind the images began with the Director’s Community, Integrity, Diversity strapline and from there, we themed the four images on the ‘stations of the cross’. Taking different aspects of The Passion, I wanted an ‘everyman’ feel, hence using all ages as well as a girl. The pictures needed to create a reaction too: Whether a spectacle, an enigma or even unease. As you can see from these pictures, some of the final images were easier than others and I’d like to thank the sitters as well as those behind the scenes. Thanks to Violet, John, Tom and Bob and also to Jo for makeup, Tim for Scaffold, Matt for studio space and also to my assistant Holly.